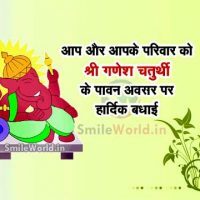 Latest Collection of Ganesh Chaturthi SMS, Greetings, Wishes, Badhai, Shubh Kamna, Ecards, Pic Messages You Can Download Ganesh Chaturthi Wishes in Hindi and Share With Facebook and Whatsapp Friends and Family. गणेश उत्‍सव के पावन पर्व में…!! आप और आपके परिवार को… श्राी गणेश चतुर्थी… के पावन अवसर पर हार्दिक बधाई!! Aap Aur Aapke Parivaar Ko Shri Ganesh Chaturthi Ke Paawan Awsar Par Hardik Badhai….! !